Great job on the ghan Scarlet. It's really pretty and I'm sure she'll love it. It's BEAUTIFUL!!! You did such a great job on it. I'm sure she'll LOVE it!!! I know it will perfectly in that room she has planned but it would be great in any room. 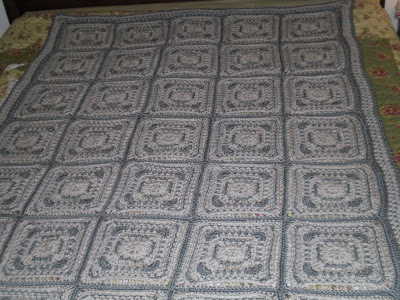 I love how you worked the border to match the pattern of the squares. It is really nice that you don't have to follow the pattern stitch for stitch and can add your very own personal touches. 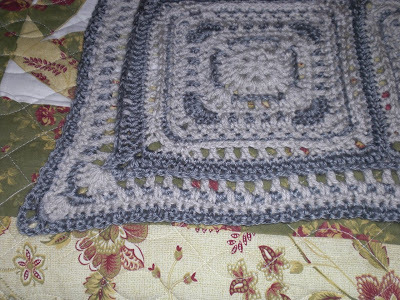 Congratulations on finishing that beautiful afghan! Wow, I know that your Mother-in-Law will be thrilled with it! Great job!